Innovative drying system for high quality film casting based on our proven experience and expertize in process technologies for the production of film materials. The production line begins with a slot die that applies an accurately controlled layer of liquid product onto a polished steel belt. From here it passes through the Venturi dryer where the solvent – aqueous or organic – is evaporated quickly, efficiently and in a manner that leaves the end product almost completely free of tension both laterally and longitudinally. 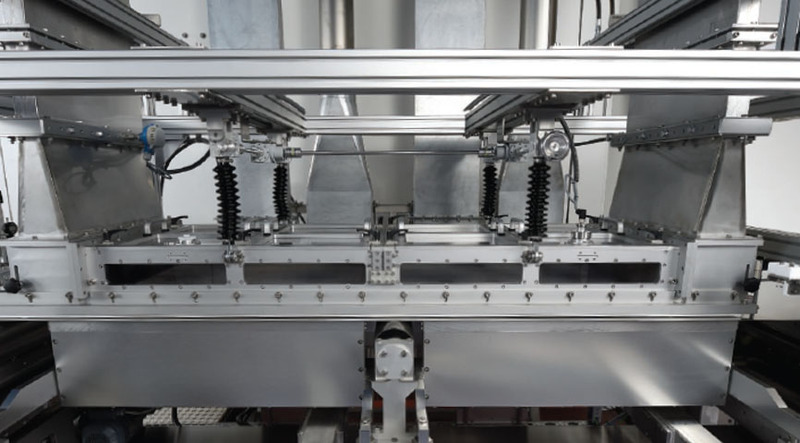 This high precision system dramatically improves the casting process, enabling the production of film products to exceptionally narrow tolerances without any risk of skin formation, and eliminating costly faults and imperfections in the final material. The inherent benefits of this indirect drying solution also result in an exceptionally high degree of energy efficiency. While the IPCO film casting system offers a number of unique market benefits, the compact Venturi dryer can also be used in conjunction with other drying technologies including traditional impingement dryers. The key benefits of the IPCO Venturi dryer are achieved through the use of a permeable metal foam above the drying film. A flow of tempered air is applied to the upper side of this foam-like metallic material, creating a low negative pressure on the lower side in accordance with the standard laws of pneumatics. As a result, a constant and even suction flow is formed, delivering a homogeneous drying effect. This minimizes thermally-induced shrinkage and eliminates the risk of structural defects in the surface and layer structure of the film. The introduction of the IPCO Venturi dryer enables manufacturers to achieve significant improvements in product quality and reproducibility while also enhancing production efficiency. The increase in thermal transfer efficiency compared with conventional dryer systems also enables a reduction in the length of the drying section. The IPCO Venturi dryer has been developed in partnership with institutes specializing in coating and film casting technology. We have also worked in close cooperation with TSE Troller, manufacturer of dies for pre-metered coating.